Disclosure: I was given a download of this CD in exchange for my post. All thoughts and opinions are my own. Who likes TobyMac? Can I get a Woot Woot?!?! 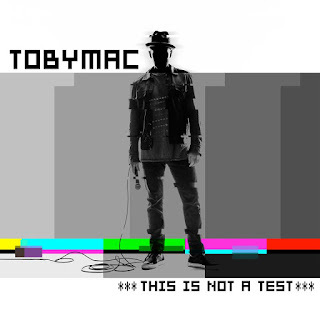 We are big TobyMac fans in this house and have seen TobyMac several times in concert. It's always amazing that the energy in the live shows comes through in the CDs. I had the opportunity to listen to the newest album, This is Not A Test, before it was released. (And if you preorder at iTunes, you'll get 4 bonus tracks.) Trust me - you're going to love it! I found the album to be full of driving rhythms and both tunes and lyrics that stuck in my head. I would find myself humming parts of songs for days after listening to them. Certain refrains were in my head. I love it when good, solid, Christian music gets stuck in my head. I know that posibive message and influence helps keep me looking forward with hope. Not sure I can pick a favorite song off the album. Of course, I loved the title track, "This is not a Test." But "Backseat Driver" and "Beyond Me" were also often on my repeated playlist. My kids have other favorites off the album ("Like a Match" and "Lights Shine Bright"). My favorite moment was when we were listening to the CD on my phone on our way into church. Our youth pastor (and big fan) pops her head out of the youth room and says, "That sounds like TobyMac...but I don't know that song...and I know ALL his songs." She knew that his new album was coming and was so happy for my kids. They even sing some TobyMac during youth church services.